Recent developments in laser scanning technology have improved 3D spatial data acquisition in road environments. These technological developments have provided rapid and cost-effective data acquisition for road corridors and surrounding areas (Guan et al. 2014; Li et al. 2016; Li and He 2016; Lin et al. 2011). 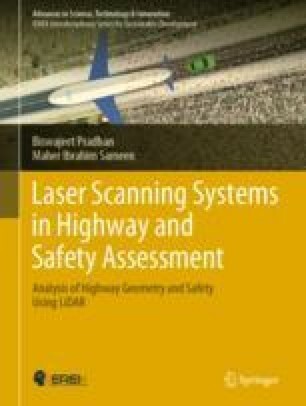 Several methods have been proposed for the delineation of geometric road information from laser scanning data. Road geometric information includes road width, cross section, and superelevation and involves the number of road lanes and vertical and horizontal curves.